Please click here to sell your Ken Potter painting or receive a free art evaluation of your piece. Click to review some of the paintings we've recently purchased by Ken Potter. 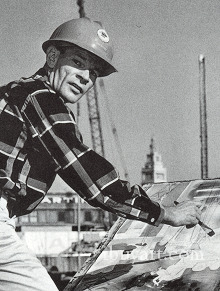 Ken Potter is a third generation Californian. 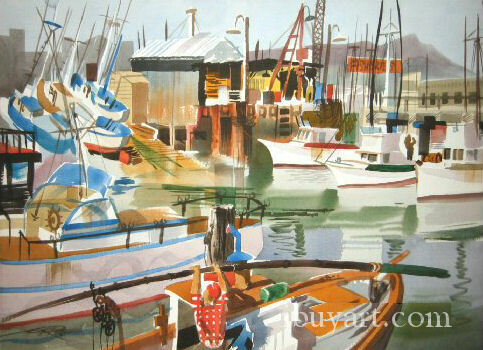 He grew up in Northern California during the Depression and began drawing regularly at an early age. While living in Sacramento, Potter received art instruction through a WPA. sponsored program. As a teenager, he visited the 1939 World's Fair art exhibit in San Francisco where he viewed works by many of the world's greatest artists. He was particularly excited about modern works, especially the French modernists. When America entered World War II, Potter was well prepared. He had been in an Explorer Sea Scout program as a youth and in the R.O.T.C. as a teenager. As a United States Marine, Ken moved right into a position providing security for admirals and chiefs of staff. He later saw action as a combat machine gunner. He manned 20 and 40 mm anti-aircraft weapons on battleships engaged in daily combat off the coast of Japan. He spent his free moments sketching portraits of his fellow shipmates; marines and sailors. Many of these sketches were sent home to their loved ones. After the war, Potter visited New York and Chicago before returning to San Francisco. Upon his return, he studied art on the G.I. Bill with Carl Beetz, Hamilton Wolf and Richard Stevens. Both Wolf and Stevens taught geometric abstractionist ideas in art. In addition, his interest in the watercolor medium was heightened after attending presentations by Millard Sheets and Dong Kingman. 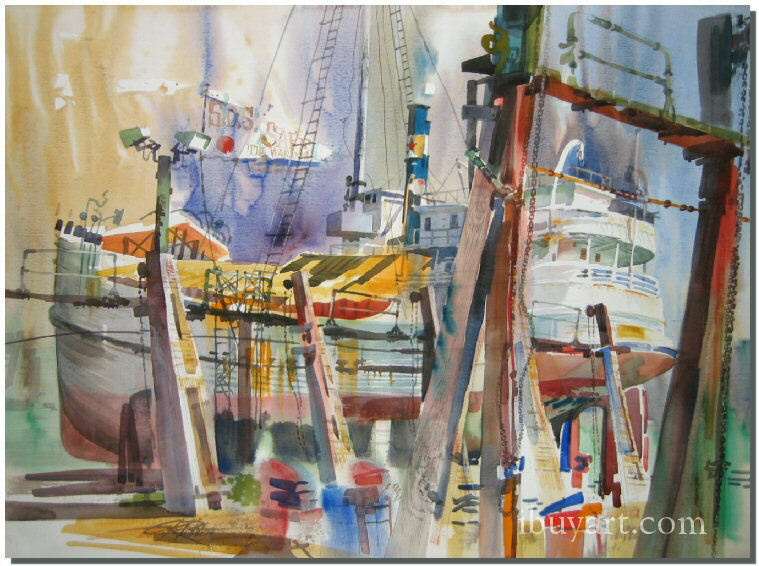 Ken Potter was painting expert watercolors by this time but felt he wanted additional instruction. He traveled to France and Italy and studied painting with famed Cubist Jean Metzinger. He attended less formal classes with Fernand L6ger and Albert Gleizes. In Italy, he received instruction in fresco painting and printmaking. By the early 1950s, he presented one-man shows in Paris, San Francisco and Rio de Janeiro and contributed works to groups shows in New York and California. For a brief time, he lived in New York and Brazil and eventually returned to San Francisco. He settled into a flat in North Beach, which was the West Coast center for artists, poets, jazz musicians and philosophers, and began to paint. 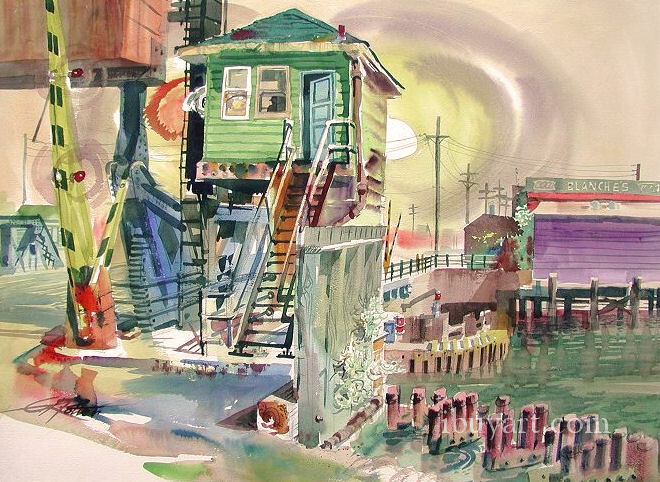 He painted watercolors daily, visiting the waterfront and Embarcadero where he produced depictions of ships, cranes and industrial objects. When they decided to tear down the old produce district, Potter did a series of paintings which are masterful works of art and serve as valuable historical documents. Ken has primarily worked with transparent watercolors and is known for his ability to manipulate large areas of flowing paint into bold compositions with expert design. His art often shows the influence of cubism and divisionist modern art ideas, but true to all innovative artists, his personal style dominates his work. Ken Potter biography posted with permission of �California Watercolors 1850-1970� by Gordon T. McClelland and Jay T. Last. Copyright Hillcrest Press, Inc. 2002.